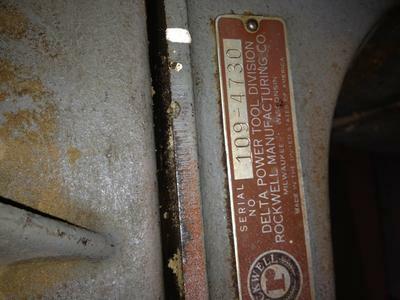 6" Delta Power Tool Division, Rockwell Manufacturing Co Jointer. Has NJ 227 Stamped on the fence and NJ255 stamped just under the knives. I have looked for a manual for a 109-4730, but can't find one. I did see online that this series of numbers maps to 1953. Does anyone have insight on a location for a manual, or a different number to use? From pictures on here, it looks like a 37-205 (but the cast iron stand has been replaced with a wooden frame), and it appears that all the old Delta Jointers use a 37- prefix for their model numbers. I found it at a yard sale across the street, and nearly died twice trying to move the heavy beast home. I'm in the process of removing the light rust on it, greasing up the springs, and building a new guard, since the original is missing. I'm also going to wire up a new (safety) switch, since the original is on the side of the motor--under the table. This isn't the best location for a shutoff, since it is right next to the axle for the motor. The 1/2" ball crank handle to raise and lower the cutting depth is missing. I can move this with some vise grips, but I will have to get a replacement. I'll probably fashion a steampunk style handle out of oak since I'll be able to do this faster and cheaper than trying to find a replacement from ebay. 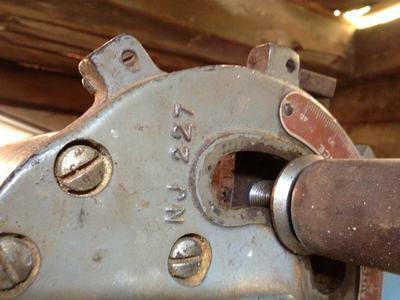 I BOUGHT THIS JOINTER AT A GARAGE SALE NO TOP PULLEY ON CUTTER HEAD...DOES ANY BODY KNOW WHAT SIZE PULLEY I NEED ///// THANKS T. E.
In the late 70's I picked up that same joiner and it had been used in a High School. It had no motor and the bearings were noisy. The bearings are real easy to replace only 2 of them on each side of blade in teh Headstock. I think at that time I replaced both bearings for under $20.00. I picked up a good used motor at a garage sale that was a 3/4 hp I think it is 3450 rpm. for $15.00. I did a thourough cleaning and oiling etc and it works lie a charm. I am still using it and it works like a champ. That is back when tools were made in this country out of cast and were easy to fix and rebuild. I am still picking up old tools and restoring them. One can't buy anything new liKe the way the OLD ONES WERE MADE. You are a Lucky man for finding that machine I hope you can get teh Crank problem fixed. The way they are designed when you turn handles it raised and lowers the gibs for setting the depth etc. When holding the uppper end fo handle it actually spin in your hand if your gibs are welll lubricated etc. can't be repaired as easily as steel blades.